"Hello lovely Emma Lamb readers! I am so honored that Emma asked me to participate in her Colour Story series. I share Emma’s love for colorful fibres and talk about it on my blog, One Sheepish Girl. 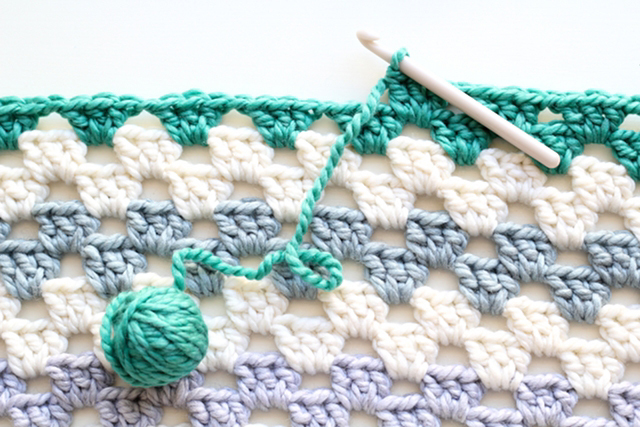 When I design a new pattern I am always inspired by a bright and cheerful color palette. For my Colour Story I collected some of my favorite blue and green photos and reflected on the meanings associated with these hues. Ever since I was a little girl, I always answered “Blue!” when asked about my favorite color. When the sky is clear and the only visible color is a bright blue, I can’t help but smile. I appreciate cloudy days when a blue-grey blanket dims the sun, allowing the world, and my racing mind, to quiet down a bit. Whenever I am in doubt or lacking inspiration on a new knit or crochet project, I turn to my trusty blue yarn palette. I recently used a lighter blue yarn when experimenting with crocodile stitch. I love how the rows of scallops resemble the blue waves of the ocean. I usually pair blue yarns with green, my second favorite color. Green is so happy and fresh. I recently completed a giant granny square blanket with an emerald green stripe that stands out against the creams, greys, and light blues. I enjoy using color in my work and capturing color with my camera in the world around me. 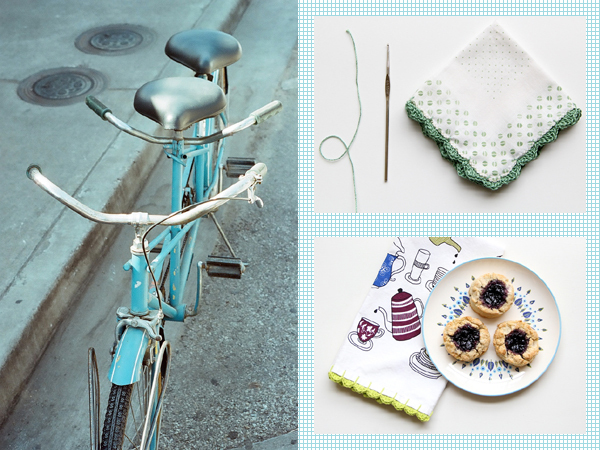 Whether it is a blue bicycle parked in front of my favorite coffee shop or a batch of blueberry jam filled biscuits cooling on my kitchen counter, colorful inspiration is always available. I just have to remind myself to open my eyes and experience the colorful world outside my front door." "When the sky is clear and the only visible color is a bright blue, I can’t help but smile." ...I could not agree more! 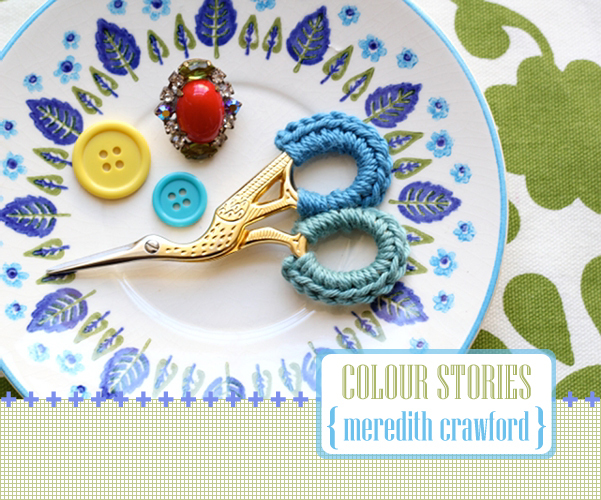 Thank you so much dearest Meredith for sharing your beautiful colour story, it feels like a wonderful breath of fresh air to me today. Just what I needed! I love Meredith's work! 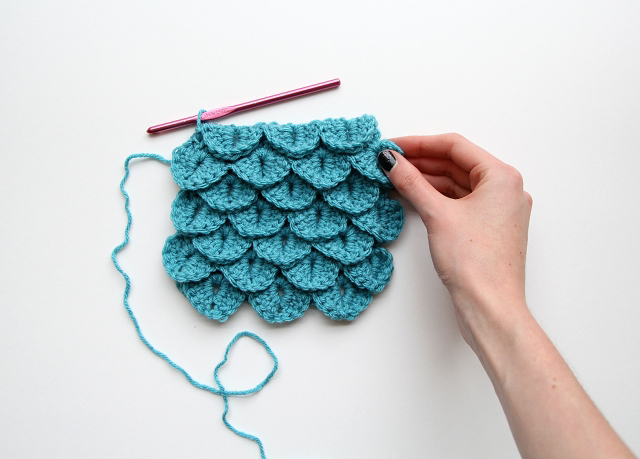 Crocodile stitch is just awesome, isn't it? Love your blog! I am so glad I found it. Your pillows are so nice and the buttons ever so sweet.